Here is the list of best free maze Games for Windows. This list contains very interesting and entertaining free maze games suitable for all age groups. Some of the maze games in this list come with 3D high definition graphics, while some come in 2D view. The objective of all these maze games for Windows is same, i.e. to reach the goal by finding the correct path. One of the maze games in this list will take you to the real haunted adventure. In the following list, you will also find the classic Pacman game in 3D along with a maze game with Mario in it. The Lost Maze: This is the only horror maze game in this list. The concept of this scary game is simple. You are trapped inside a haunted maze and you have to find the key to open the exit door before the monsters and spirits in the maze attack you. Wear your headphones and start your haunted journey. Enter at your own risk! 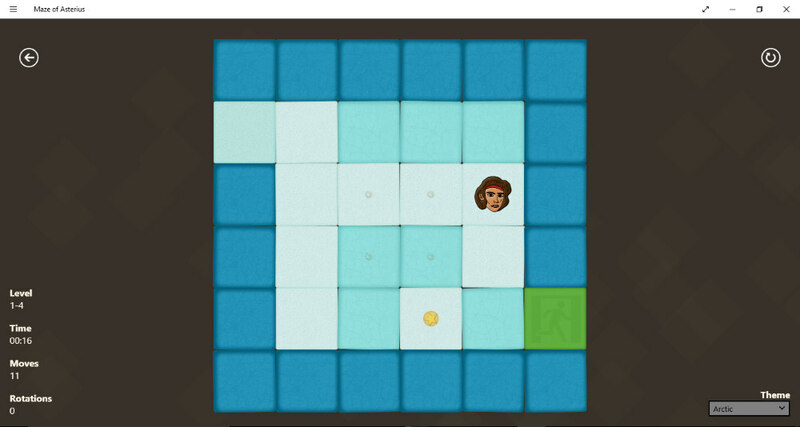 Pusher: This is a logical maze game for Windows. Here you have to arrange all the dispersed boxes at the storage location provided in the maze. Use arrow keys for easy navigation. You can move only one box at a time. This maze game is suitable for all age groups and is a good brain exercise. Go through the list and install these maze games for Windows on your system and enjoy a couple of entertaining hours. You may also like best free Board Games For Windows, Alphabet Games For Kids, and Spot The Differences Games. PAC-Man is the most popular maze game that is played all over the globe. It is also one of the favorite games of kids. Download and install PAC-MAN Original, the original Pac-man game for Windows. This is a Windows 10 app. Its sound effects are very cool. 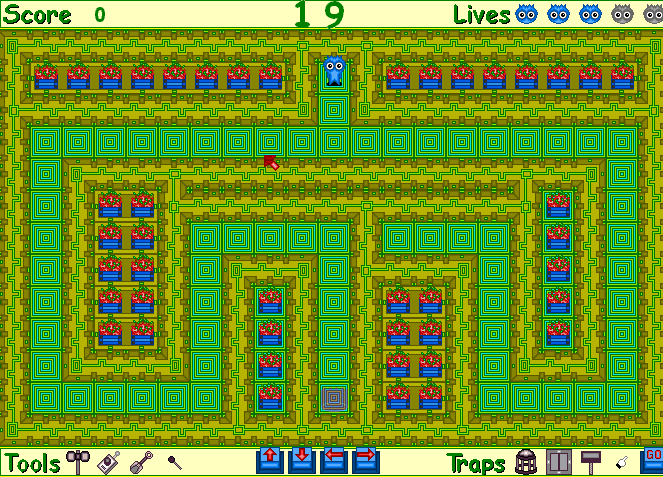 The objective of the game is to eat all the dots in the maze, before getting trapped by enemies. Initially, you will get 3 lives in each level, which decrease one by one as you get caught by your enemies. Use the arrow keys on keyboard to navigate the Pac-Man. You can see your high-score at the top of the screen. Pac-Man can kill its enemies too. In the maze, you will find some dots bigger in size, as compared to the other dots. The Pac-Man will get extra powers for a short duration on eating these bigger dots. While the power is active, Pac-Man can eat its enemies. Beware! as the enemies Pac-Man eats while in power, regenerate right after. Download one of the most popular games and enjoy playing it on your PC. Download PAC-PAC, a very interesting maze game for Windows. 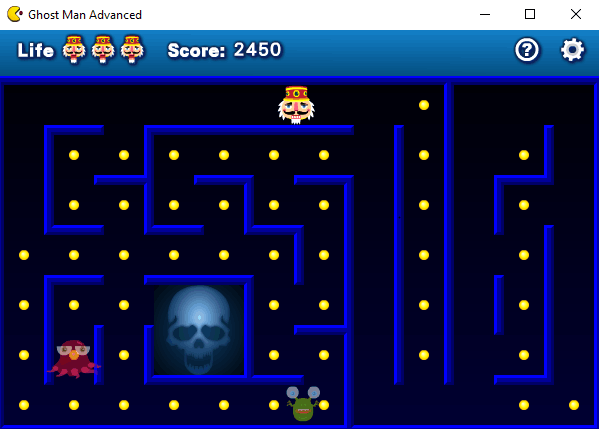 This Windows 10 app is identical to the most popular and most played maze game: Pac-Man; however, the characters look a bit different. Like the Pac-Man game, the concept behind the game is same here, i.e. to eat all the food on the maze without getting captured by the enemies. You can use either your computer’s mouse or arrow keys on your keyboard to navigate the direction. I found using arrow keys on the keyboard more convenient than using mouse. There are a lot of interesting levels in this game. You have to eat all the food on the maze of a level in order to proceed to the next level. As you proceed further, the game will become more difficult to play. Like Pac-Man, you will also find some enemies here, which you should avoid in order to complete a level. You will get 5 lives in each level. You will lose one life if you are caught by any of the enemies. For protection from enemies, there are some bigger dots in the maze, which provide you some extra powers. After eating these bigger dots, you can bite your enemies to push them off. You will be awarded some points on biting enemies and eating small food particles (small dots). Difficulty levels: It comes with 5 difficulty levels from very easy to very hard. 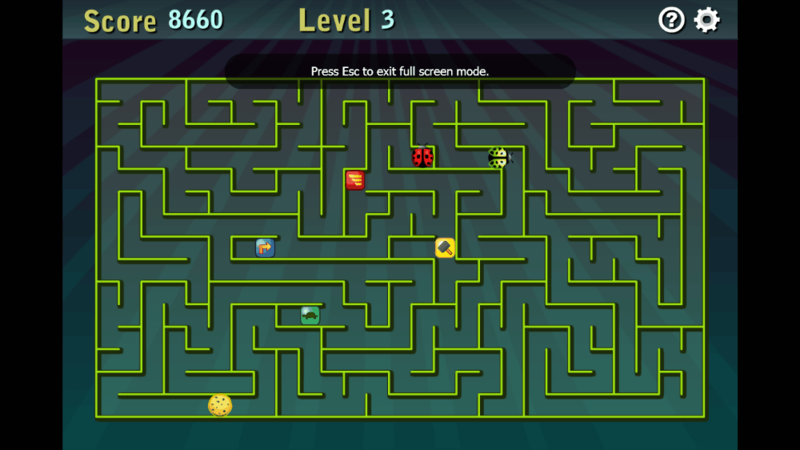 PakMan is a free maze game for Windows and is one of the best Pacman game for PC available. The best part about this game is that it is a 3D Pacman game. Your aim in the game is to collect all the diamond shaped pieces from the maze within the given time (60 seconds). This time may vary at higher levels. If you will be able to do so, you will proceed to the next level. But there are other creatures on the maze which you must avoid, or you lose a life. For your convenience, the total number of pieces and the number of pieces collected by you are displayed on the screen. Navigate the PakMan by pressing the arrow keys on your keyboard. In the beginning of the game, 3 lives will be provided to you. This game is categorized into three difficulty levels: Baby Trip, Nice Journey, and Big Adventure. The difficulty level also increases as you proceed to the next levels. The time limit is same for all levels. On your way, you will find some reinforcements and clock. The clock will increase the time for clearing a level. 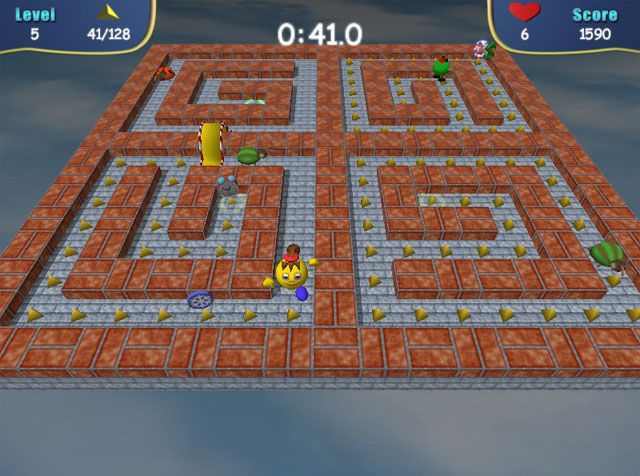 Here comes one of the kids favorite game character Mario in a maze game for PC. 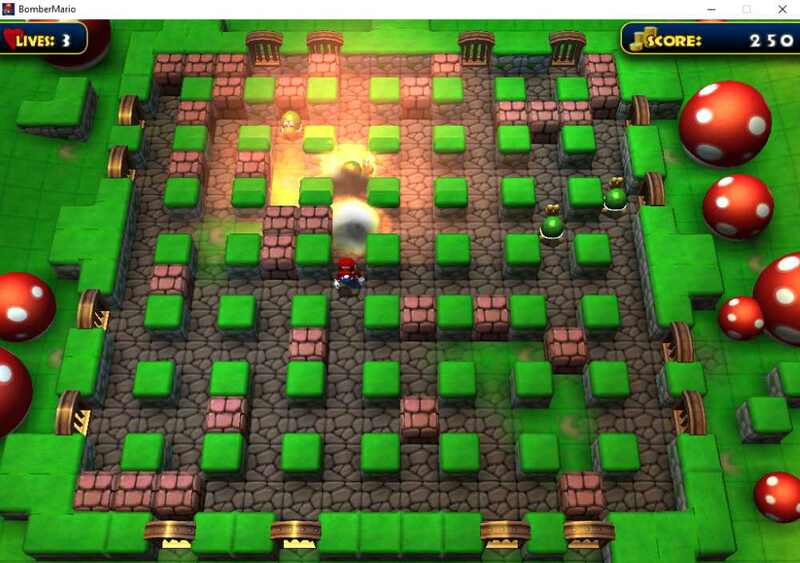 Bomber Mario is an interesting maze game, where you have to kill your enemies in the maze by placing bombs at different locations in the maze. But, beware of the bombs that you placed in the maze, as these bombs can kill Mario too. You will get three lives at the beginning of each level and your score is displayed on the top right corner of the screen. 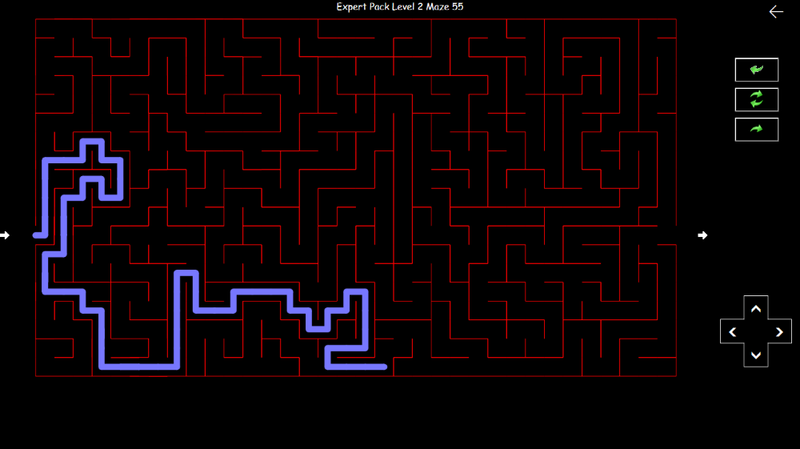 There are a lot of mazes available in the game. I don’t know the exact number, but every time I launched the game, it shows me a random maze pattern. That’s the part of the game I liked the most. The high definition graphics and cool sound effects make this game interesting to play. Welcome to the The Lost Maze, a haunted place where you are trapped inside. Find the exit before the monsters of the maze attack you. This is a Windows 10 app which comes with high definition graphics and scary sound effects. You can only exit this haunted maze after collecting its treasures. The total number of treasures you have found along with the remaining ones are displayed on the top left corner of the game. The time taken by you is also displayed. Beware of the monsters and traps on your way, as they are present everywhere in the maze. When you see a monster, you can select whether to attack it or defend yourself. Keep an eye on your heath bar in the game while playing it. It comes with three difficulty levels: Easy, Normal, and Hard. Your game will be saved automatically on exiting. High quality graphics and sound effects. With amazing graphics and great sound effects, this is a very addictive maze game for computer. Install this game on your PC and get ready for a haunted adventure. One star for finding your lost friends in the maze. One star for finishing a level within the time limit. One star for finishing a level after finding a star in the maze. Try to get all the three stars in this maze game. This Windows 10 app comes with three difficulty levels: Easy, Normal, and Hard of which each level has 20 different stages to play. Controls: Use WASD or arrow keys on keyboard to navigate. Click on top view button for viewing the maze from top to find the correct path quickly. 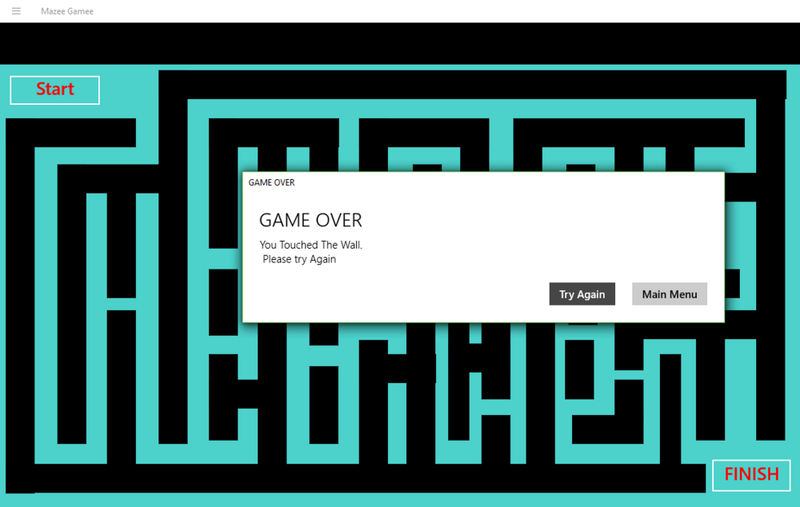 Penka Mazes is an interesting free maze game for Windows. A Penka is trapped in a maze and wants to exit from it. 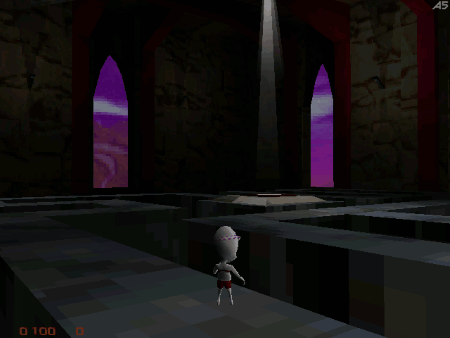 The objective of the game is to help Penka get out of the maze by guiding him to the exit portal. To guide Penka, you have to place arrows on the maze, showing the way out. To select the direction of the arrow, press the respective navigation key on your keyboard. Then place the direction sign in the map to guide Penka out of the maze. This maze game for Windows comes with three playing modes: Story Mode, Sphere Mode, and Time Attack Mode. All the three modes are interesting. The time attack mode is the most challenging one among these three, because in this mode, the Penka moves at a very fast speed. You will be given some time in each mode to think where to place arrows in the maze. You will lose one life when Penka collides with any boundary in the maze. You can use tools and traps to clear the obstructions on your way. Eat reinforcements like Power Spheres and Fruits to increase your score and get extra lives. You will get 3 lives at the beginning of each level, but you can increase them up to 5. Read instructions provided with the game to know how to play it. Running Sheep: Tiny Worlds is a very interesting maze game for kids. This game comes with animated characters along with funny background music. The concept of this game is similar to the maze game in our list: Penka Mazes. Your goal is to help the sheep reach their home safely by guiding them through correct path. In each level of this game, some arrows are provided, you have to place these arrows on the maze in such an order so that they could form the correct path to home. This free maze game for Windows comes with tutorials, with the help of which you can learn how to play this game. If we talk about the levels, it has 200 levels to play and each level is more difficult than the previous one. You have to guide all the sheep in the home safely in order to proceed to the next level. At the higher levels, you will find many obstructions like dogs, pits, etc. Avoid such obstructions to clear that level. Remember, you have only one life in each level. One more thing that you should keep in mind, you should complete a level within the given time limit, otherwise, your game will be over. You can view your scores in the Leaderboard section of the game. You can add up to 5 players in the game. You can save the game in 5 different slots. After the completion of each level, you will be rewarded with medals, which totally depends on your performance in that level. 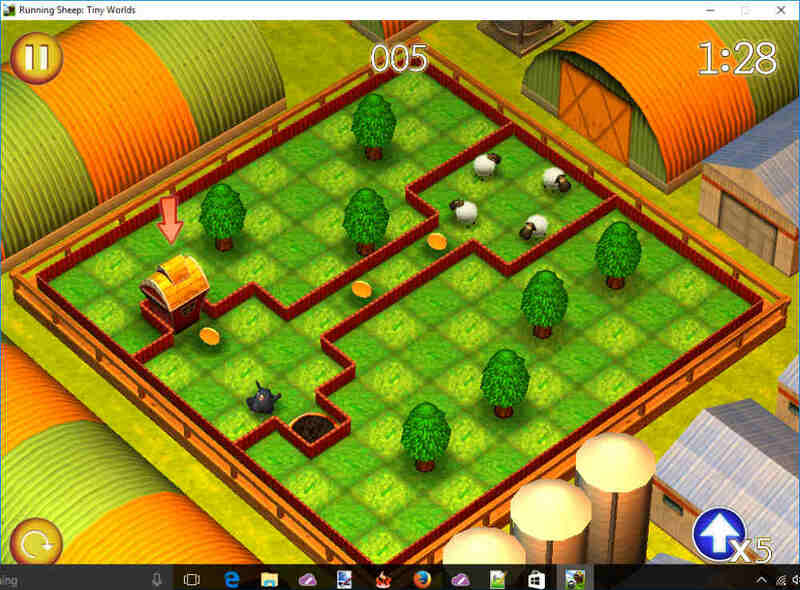 Running Sheep is another free maze game for PC in this list. Its pretty much similar to Running Sheep: Tiny Worlds. Like Running Sheep: Tiny Worlds, the rules and playing method of this game are same. This game differs only in the terms of themes, music, and some animated characters. It comes with tutorials which will teach you how to play this game. You have to help all the sheep to reach their home safely by placing arrows on the maze in the correct directions. Avoid obstructions like enemies and pits. To rotate an arrow, just move the mouse in a circular path by holding its left click. You will have only 5 arrows in each level. This game comes with many exciting levels, where each level is more difficult than the previous level. You can proceed to the next level only if you cleared the previous one. Remember to keep an eye on the running clock, as you have to finish every level in this maze game within the given time limit. In this game, up to 5 different players can be added and each player can save the game in their respective slot. Unlike Running Sheep: Tiny Worlds, this maze game does not have any Leaderboard menu. 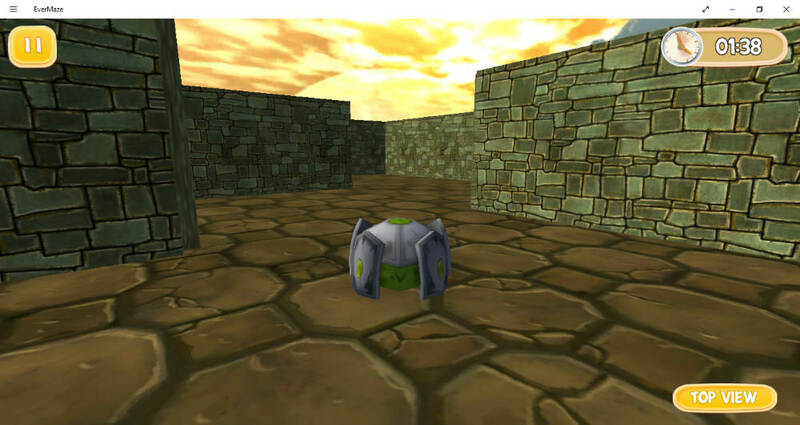 3D Monster Maze is a free maze game in this list of free maze games for Windows. The objective of this game is to escape from the maze in which you are trapped. But the exit door of this monster maze is locked. So, you have to find the key to it first. Beware! There is a monster roaming in the maze in search of you. So, you have to find the key before the monster finds you. If you are caught by that monster, the game will be over. All the paths of this maze are identical to each other. Hence, there is a high possibility of getting lost. So, use the map provided in the game to find your way out. 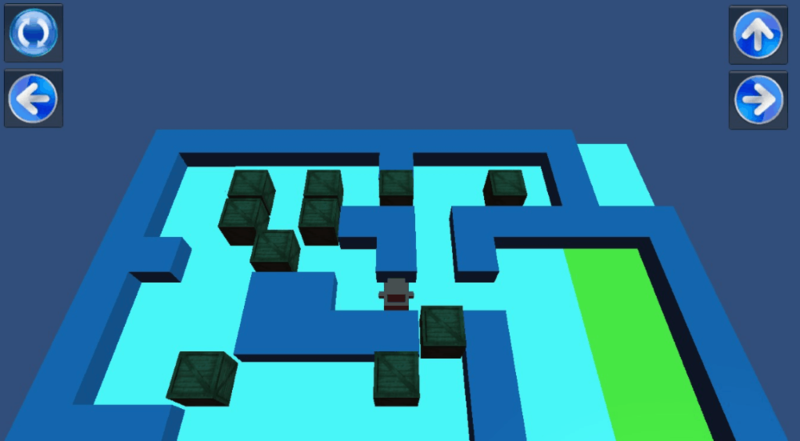 Use the arrow keys to move around in the maze. Annoying music at the beginning of the game. There’s a glitch in the game that makes the map disappear at times while playing. Ladybug is another free maze game for Windows. This game is similar to a well-known maze game, Pacman. In this game, you play as a Ladybug and you have to clear all the dots from the maze by eating them. Use arrow keys to move inside the maze. Avoid other insects and skulls placed in the maze, as insects will eat the Ladybug and you will lose one life. You will get 3 lives at the beginning of the game. The score is displayed on the right side of the maze, along with the remaining lives. There are lots of exciting levels in the game. To move to the next level, you have to clear the previous one. As you proceed further in the game, the difficulty level in the game starts increasing. At the higher level, it becomes more difficult to outsmart the bugs in the maze. Hence, play smartly and carefully at the higher levels. The maze looks very similar to Pacman and the game is equally entertaining to play. Mazee Gamee is a challenging maze game for PC in this list. This game has only one level, still its really interesting to play and requires good concentration. Unlike other maze games, there is no character or object who is stuck in a maze and has to find a way out. Instead, you just have to move your mouse cursor through the maze, and get it out of that. It is not as simple as it sounds. The most difficult thing in the game is that you cannot let the mouse cursor touch the walls of the maze, otherwise the game will be over. The thickness of the maze keeps varying, so at times it becomes very difficult to navigate the cursor through the maze. Also, as it is a maze, so there are a lot of incorrect paths, and if you take your mouse cursor through an incorrect path, then you will have to again get it back on the correct path, before you can get it out of the exit. And all the while ensuring that the mouse pointer does not touch the wall. Initially I thought this game would be simple to finish, but it took me a lot of tries to actually finish this game. Unlike other maze games which require problem solving skills to find the correct path, this one also needs stable hands, and a lot of patience. Easter Maze is a maze game for Windows, developed for kids. This Windows 10 app comes with very cute animated character, Bunny. You have to help this bunny to collect all eggs from the maze. Guide the bunny with the help of your computer’s mouse. Simply click and drag the bunny in the direction you want to move it. To clear each level, it is necessary to collect all the eggs from the maze. Every upcoming level is more challenging than the previous one. So, you need to be more careful at the higher levels in the game. Try to avoid the deadly creatures in the maze. If you come in contact with them, you will lose one life. You get 3 lives at the beginning of each level, so be careful. Along with eggs, there are some hearts in the maze. These hearts will provide some extra powers to the bunny. After eating these hearts, the bunny becomes invisible for his enemies for some time. This will help him in collecting more eggs quickly. This is a very interesting maze game for kids as it comes with cute animated characters and cool sound effects. Ghost Man Advanced is another free maze game for Windows. In this game, you will play as a Ghost Man and your aim is to eat all the food in the maze. Avoid coming in contact with other ghosts, as they can harm the Ghost Man and your game will be over. When you eat all the food in the maze, you will proceed to the next level. On your way in the maze, you will find some large red colored foods. On eating these foods, Ghost Man will become invisible for some time and can swallow other ghosts. You will get three lives at the beginning of each level. Try to beat the high scores of other players to view your score in High Score list. You can share your score on social media. Many exciting levels are waiting for you; install this maze game on your PC and have fun. A Maze race II is another interesting maze game for PC in this list. The objective of the game is to reach the aim before your opponent, which is food. To reach first, find the correct way through the maze. Use the arrow keys to control the direction of red ladybug (your character). After the completion of each level, points will be rewarded to you, which you can share over social media. There are some reinforcements in the maze, which help you reach the goal before your opponent. One of these reinforcements is Show Map, which shows the way to food particle with red colored arrows. You can read the full description of all reinforcements in Help menu of the game. In the higher levels of this maze game, the maze will become more complicated, making it difficult to find the correct way. Download and install this game on your PC and have some good brain exercises. 3D Maze Hunter is a Windows 10 app. 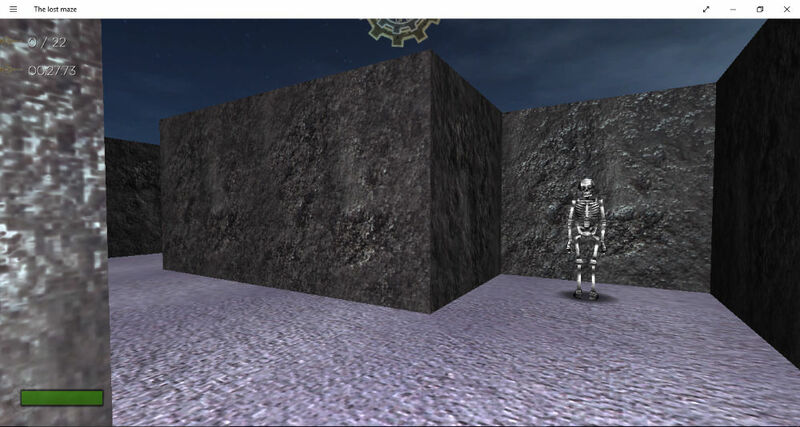 This is a 3D high graphics maze game for Windows, suitable for all age groups. The objective of the game is to find out a chest hidden in the maze within the limited time. If you will be able to do so, coins will be rewarded to you, which you can use to unlock other levels. Use arrow keys on keyboard to navigate through the maze. After finding the chest within limited time, you can replay that level. Every time you replay a level, the chest will be located at a different location in the maze. Hence, you will never get bored of playing this game. All the paths of this maze are identical, hence, creates confusion. There are 5 different levels in the game. You can either buy these or unlock them by collecting coins. This is a very interesting maze game for PC which will take you to the Ancient Adventure. Install this game on your PC and enjoy your journey. Pac Squirrel is another free maze game for kids for Windows. This Windows 10 app is similar to Easter Maze. The objective of this game is simple: collect all the nuts in order to proceed to the next level. Keep your squirrel away from other creatures, as they can kill little squirrel and the progress of that level will be lost. Remember, you will get only one life in each level. There are 196 exciting levels in the app. At the higher levels, you will face more challenges as the higher levels are more difficult and challenging than the previous ones. 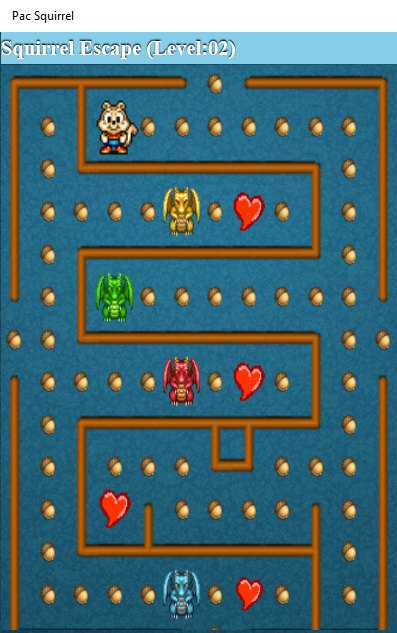 Other than nuts, there are hearts available in each level of this free maze game for PC. These are the type of reinforcements on eating which, the squirrel becomes stronger for some time and remains protected from its enemies for a short time. Use the arrow keys on your keyboard to move the squirrel, or you can also use computer’s mouse for the same. This is a very good game for kids, but there’s no sound effect, which makes it a bit boring. Tilt Maze is an addictive maze game in this list of free maze games for Windows. This Windows 10 app is based on a simple principle of collecting all small squares in the maze before exiting it. You are given a red ball to play with, and it can exit from the maze only after collecting all the squares from it. Use arrow keys on your keyboard to navigate the direction of the red ball. You can also use the keys displayed on the screen to control the ball’s direction. The game is not as simple as it sounds. The biggest challenge in this game is to make ball stable while controlling it. The red ball bounces every time it strikes any wall of the maze. There is a certain time limit for each level and you have to complete that level within the given time, otherwise you will lose that level. Moreover, an upthrust is acting on the ball continuously due to which the ball loses its stability. Also, there are some white colored circles in the maze which can trap your ball and you will have to start the level again. Your score along with the high score is displayed on the screen. This open source maze game for Windows comes with 30 exciting levels. Maze (The Amazing Labyrinth) is a very interesting maze game for Windows. This Windows 10 app comes with a lot of levels to play. But, only 10 levels are unlocked in its free version and rest are paid. You can select any of these levels randomly. This is a challenging maze game in which you have to take a ball to the target safely without getting trapped into the holes. 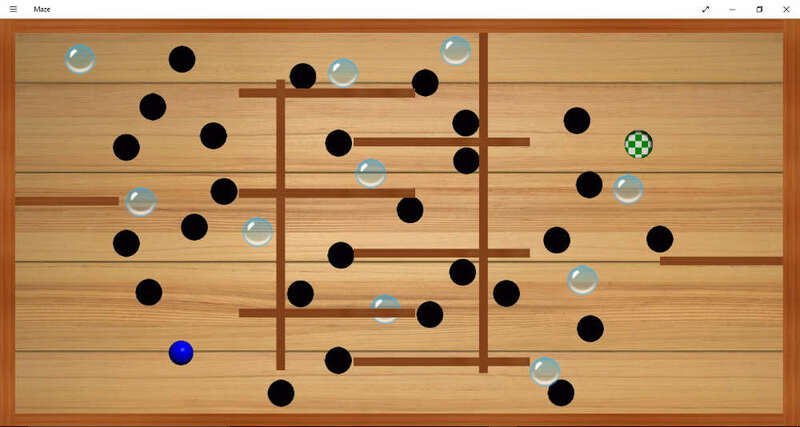 Navigate your ball by pressing arrow keys on your keyboard. You can vary the speed of your ball in the settings menu of the game. This is a very interesting maze game for Windows which requires a great concentration. Install it now! Quick Maze 2D is a challenging maze game for Windows. This is a Windows 10 app and is similar to A Maze Race II, in which you have to help the ladybug eat food by finding a correct path. Here your aim is to get the ball out of the maze within the given time. Use arrow keys on the keyboard to control the direction of your ball. This game comes with 12 levels, further categorized into Easy, Medium, and Hard levels. In addition to these levels, various challenges are also available in the game, which also contain lots of interesting levels. This is a very interesting and challenging maze game for Windows. Ice Labyrinbth is another interesting maze game for Windows. This game is very easy to learn. Your goal is to reach to the aim, which is a trophy. Collect all the stars in order and then go for the trophy to proceed to the next level. Use mouse to navigate the direction and speed of the ball. Avoid holes and other obstructions on your way, as these obstructions will steal one life. You will get three lives to complete each level. 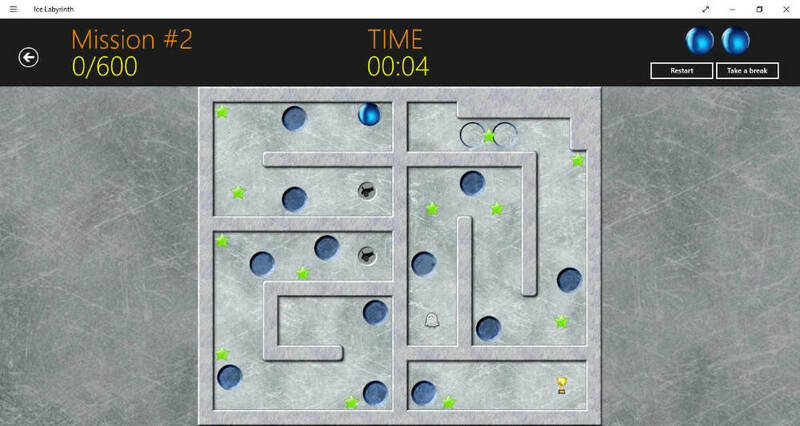 This maze game come with three difficulty levels: Casual, Intermediate, and Challenging, out of which only Casual level is unlocked in the free version. Each of these levels has 12 different stages. In the free version of this game, you have access to only 6 stages of casual mode. If you want to play all the levels of this game, you have to purchase its full version. You can view your achievements in the Achievements menu of the game. This Windows 10 app supports two languages: English and Francais. Classic Marble Maze is a Windows 10 app. 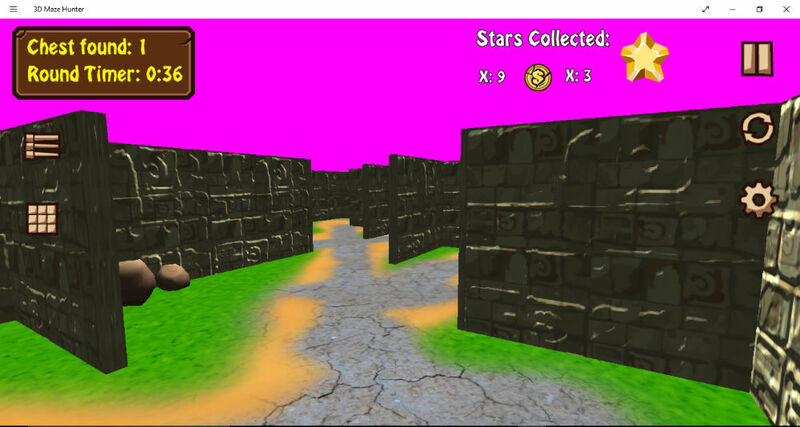 This is a 3D maze game for Windows. The rules for playing the game are simple. You have to take the marble ball in the maze to its destination without dropping it into any hole. 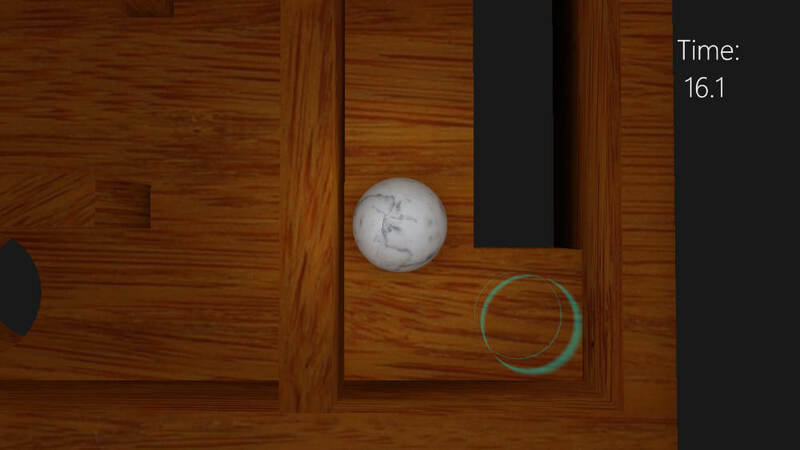 If you drop the marble, you will lose all your progress and the game starts from level 1. To navigate the direction of marble, you can either use arrow keys on keyboard or can use your computer’s mouse. This is a very simple game developed only for fun, hence does not have any pointing scheme. It shows the time taken by you to complete a level at the end of each level. This is a very interesting maze game that comes with 3D graphics. It has a lot of levels to play. This game has some disadvantages, like: you cannot save your game and you will get only one life in each level. If you fail any level, you have to begin from level 1. Pusher is a very interesting maze game for Windows in this segment. This is a Windows 10 app that is suitable for all age groups. The concept of this free maze game is very simple. The 2D maze in the game is actually a Warehouse where boxes are dispersed in the entire Warehouse. You have to take them back to their storage location in the maze. There is no time limit, hence you do not need to hurry. Take your time to arrange the boxes at their original location. This is a logical maze game, where the complicity of the game increases as you proceed to the higher levels. While bringing the boxes back to their original location, remember that you can slide only one box at a time. Hence, apply your logic in a smart way. This fun maze game comes with 50 exciting levels. As you proceed to further levels, the difficulty level also increases. It supports more than 10 languages. Some of these are: English, Deutsch, Italiano, Espanol, Portugues, Francais, Polski, Magyar, etc. If you are looking for a maze game with lots of levels to play, you may try Switchback. Switchback is a Windows 10 app which comes with more than 3000 mazes and the best part of the game is that all these levels are free to play. 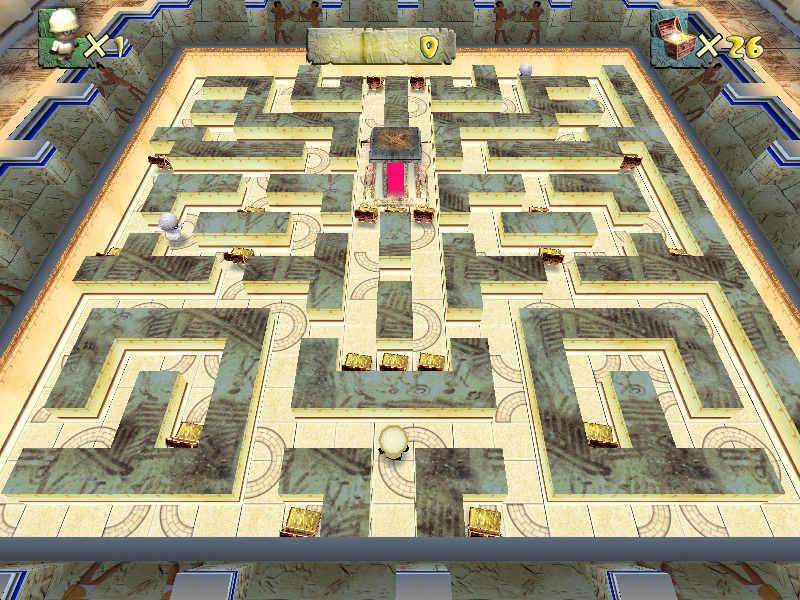 The objective of the game is to find the correct path in the given maze to escape from it. You can either use your computer’s mouse, keyboard arrow keys, or control buttons provided on the game to solve a level. For your convenience, I advise you to use arrow keys on your keyboard. There is neither time limit in any level, nor any scoring scheme, but it is a fun and enjoyable game. All the levels in this free game are categorized in 7 different level packs, based on the difficulty. Kids Maze Pack is designed for kids, thus contains the easiest levels. Jumbo Maze Pack in this app is the hardest one. All the levels are unlocked, you can select any level randomly and play. You can set any image from your computer as background. You can also check your speed in the Speed Test menu of this game. NOTE: This is an Ad supported version. 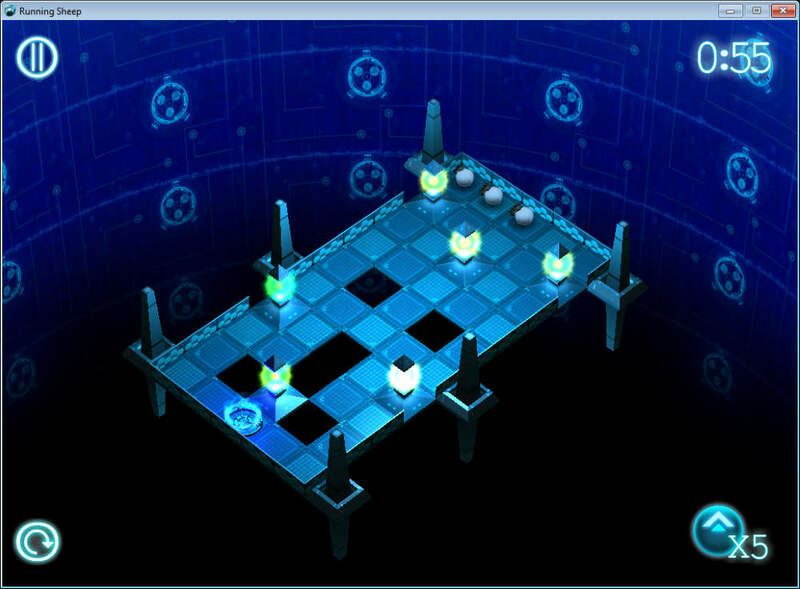 mAz Lite is a 3D and high definition maze game for Windows. This maze game is suitable for all age groups. In this free maze game, you have to help a little Alien baby reach the finish point by guiding him the correct path. To move the alien, press the arrow keys on your keyboard. You can move the PC mouse to take a view of your surroundings. It comes with a lot of exciting levels and each level of this maze game is very interesting. On your way to the destination, you will find many obstructions. It is suggested to avoid those obstructions in order to complete a level. As you proceed further in the game, it becomes more difficult to reach the goal. Shortcut keys are provided for different functions. You can take screenshots of any view in the game but it saves the screenshots in .PCX format. You can toggle game resolution simply by pressing F5 function key. You can also change the camera view. You can see all the controls by pressing F12 key on your keyboard. So, what are you waiting for? Download and install this free game in your PC and start your journey as a little alien. Maze of Asterius is a Windows 10 app that comes with good collections of mazes categorized into five different packs, based on the difficulty level. 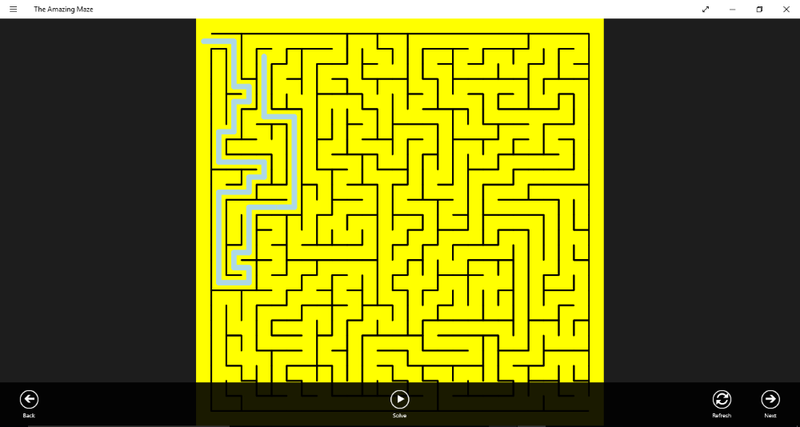 In this maze game for Windows, your aim is to reach the goal in the minimum number of moves and in minimum time. If you will be able to do this, you will get three stars. The star rating for each level depends on the number of moves and time taken to complete a level. You will get minimum 1 and maximum 3 stars on completion of each level. In addition, bonus packs are also available in the game. Each bonus level requires certain number of stars to unlock. Hence, to unlock bonus levels, it is advised to complete the levels within minimum time and minimum number of moves. This is a very interesting maze game for Windows that is suitable for both kids and adults. 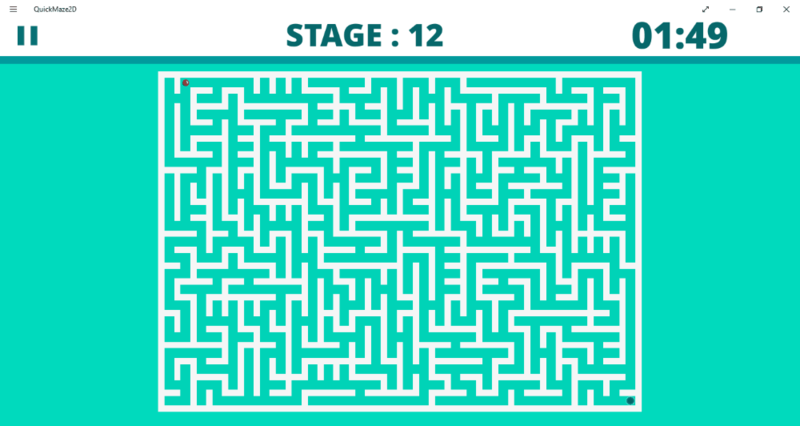 The best part of the game is that you can rotate any part of the maze to reach your goal quickly in minimum moves. 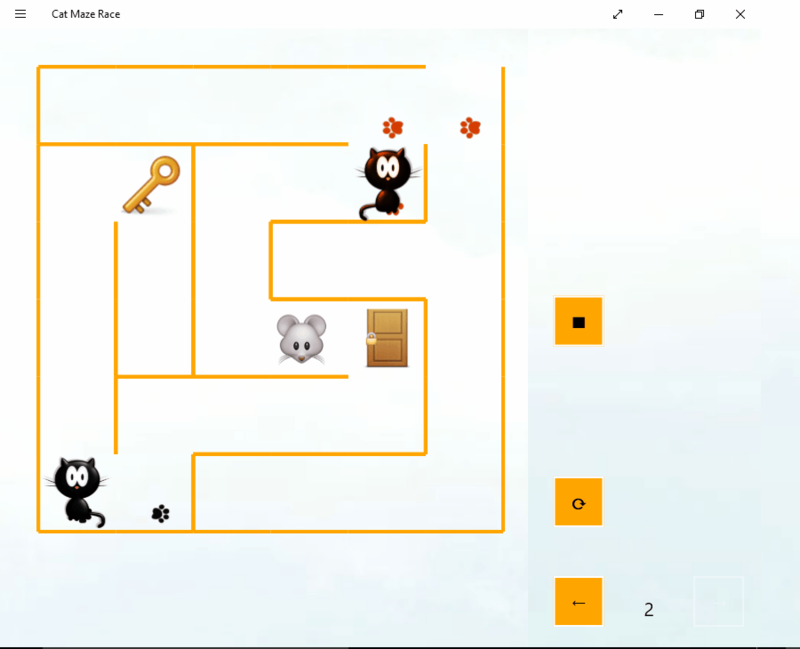 Cat Maze Race is a Windows 10 app. In this maze game for PC, you have to lead the cat to the mouse before the other cat in the maze does. If you will be able to do so, you will proceed to the next level. To make this game convenient to play, direction of the cat is controlled simply by moving computer’s mouse. As you move to the further levels in the game, mazes become more complex to solve. This is a very interesting maze game, developed specially for kids and the levels in this game are categorized into three difficulty modes. The first mode is the easiest one. In this mode, there are no opponent cats, whereas on the other hand, the third mode is most difficult one. In this mode, first, you have to find out the key, so that you unlock the door to catch the mouse. 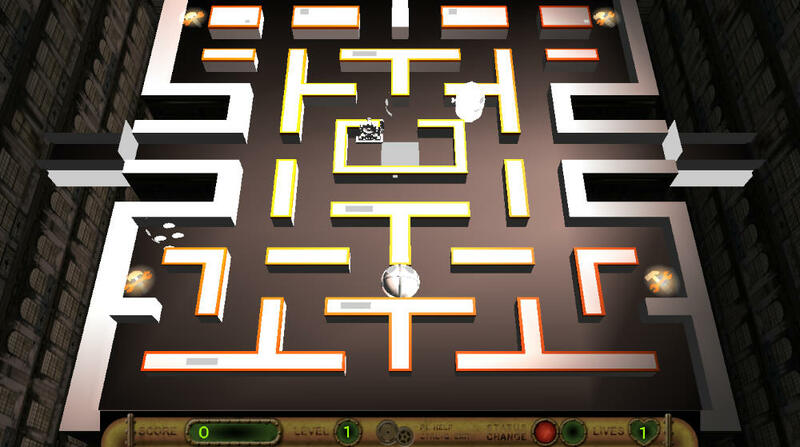 Download and enjoy playing this interesting maze game for PC. The Amazing Maze is another free maze game for Windows in this list. This is a 2D maze game in which you have to solve the maze by drawing lines in it. Draw the lines with the help of computer’s mouse. Press and hold the left click button of mouse and move it in such a way that it traces the line in the maze. There is no time limit for solving the mazes in this game. The best part of this free maze game is that it comes with hundreds of levels and is available free of cost. One advanced feature of this Windows 10 app is that you can open any random maze just by entering its dimensions from 2 to 60 and randomize each of them. You will also find a solution for all maze levels. So, if you are stuck in a maze, do not worry. Just click Solve button. Play the all new Pac-Man game, Steampac 3D. This is a new version of the most popular Pac-Man maze game. It comes in 3D mode. You can change the camera’s view by pressing C key on your keyboard. 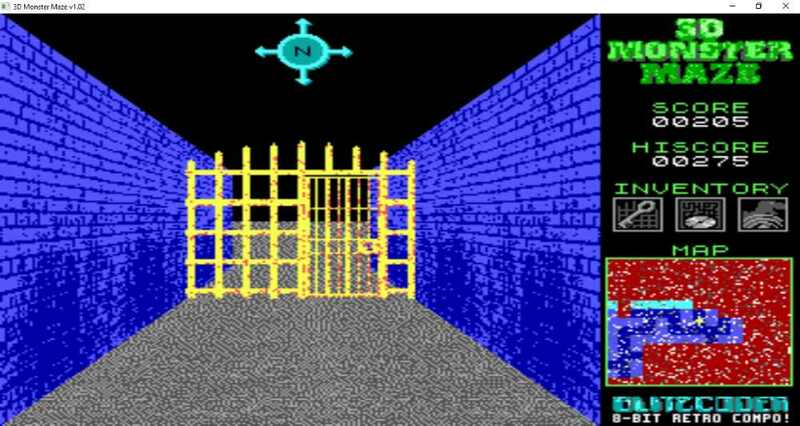 The objective of this 3D maze game is same as that of the original Pac-Man game, i.e. to collect all the items from the maze by outsmarting your enemies. If you are able to do this, then you will proceed to the next level. The higher levels in the games are more difficult as compared to the lower levels. You will get 3 lives at the beginning of each level. If any of your enemies in the maze catches you, you will lose one life and the game will be over on losing all the lives. In this condition, all the progress of that level will be lost and you have to start from scratch. Points will be awarded to you for collecting every item in the maze. Besides these items, some energy packages are also available in the game, on eating which, the Pac-man will become strong for some time. Controls: Use WASD or arrow keys on your keyboard to navigate the Pac-Man. Spacebar key can Pause/Unpause the game, whereas M key lets you Mute/Unmute the game sound. Press C key to change the position of the camera/to change the view. Esc or Ctrl+q keys quit the game. Download Mummy’s Curse, a maze game for Windows that will take you to an adventure of ancient Egypt. The game starts in a maze where you are surrounded by Mummies. Your aim is to collect all the gold chests in the maze by protecting yourself from being caught by any of the mummies. Once you collect all the golden chests, you will proceed to the next level in the game. Except for gold, there are some power-ups in the maze. These power-ups will provide you some extra powers, like Shield, which will protect you from the mummies for some time, and Speed Up, which will increase your speed for a short period of time. You will get 3 lives in each level and the number of chests remaining to collect is also displayed on the screen. Every time you collect gold, some points will be rewarded to you, which are displayed on the top of your screen. To navigate, use arrow keys on a keyboard.